QStar’s cost-effective solutions enable long-term digital preservation of content to ensure all of your vital business information is stored effectively, is easily searchable and supports compliance, collaboration and other critical business processes. As we know, legal, accounting and administrative records have a retention period of 10 years, some much longer and others still require permanent preservation. Hidden costs can significantly reduce the financial benefits of long-term digital preservation. With our long-term data storage solutions, you can extend the life of your data for decades while keeping costs under control. Forget years of exorbitant maintenance contracts and devastating fork-lift upgrades. Your data will be safe with us in an environment designed exclusively for the purpose. You no longer need to migrate data from one disk storage system to another, with all the costs, wasted time and risk that this implies. Big Storage vendors have adopted common practices over the past several years to force customers to replace their storage systems every 3-4 years, whether they need to or not. Let’s look at a couple of the techniques they use. The first approach is by stealth. They begin by charging reasonable rates for maintenance work of around 10-12%/year for the first 3 years. Then when customers come back to renew their 4th-year maintenance, they get a surprise in the form of a very heavy maintenance bill. But the vendor’s real purpose is not to renew the contract. Rather, it’s to sell you a new storage system. How? They show you the maintenance bill in one hand, and in the other a quote for a brand-new array that costs about the same! Another technique is to discontinue their support of your existing systems. Engineered obsolescence means that a forklift upgrade is obligatory. The storage platforms are designed to be difficult to expand or upgrade, so that many customers simply run out of either performance or capacity as their needs grow. Alternatively, the compatibility matrix of the new components is no longer valid for the older systems. Disks belonging to the previous version are suddenly declared “obsolete”, they cost a fortune, and are relegated to the status of collector’s items. The result? No choice but to buy another storage array and incur the dreaded Forklift Upgrade. Do you realize how much an archive that must last for years and years (and in some cases for ever) can cost? So much for savings from the dematerialization of documents. A pure illusion. There are certainly benefits in terms of process efficiency and the consultation of documents, but at what cost? At QStar we offer secure archiving solutions for your documents and data that last decades with negligible upgrade costs and a TCO that can reach and even exceed 300% a year for high capacities compared with traditional disk-based storage systems. Aside from the clear financial benefits, a tape-based data archive offers exceptionally long data life: the LTO data cartridge is designed to help organizations protect and preserve more data for longer periods. Data can be securely stored for decades provided that the tape is handled correctly in accordance with the media manufacturer’s recommendations, thus guaranteeing an archive life exceeding 30 years, if stored at a temperature of 68° Fahrenheit (20° Celsius). When it comes to managing your storage budget, more often than not a large part of it is devoted to archive storage, or data that needs to be conserved long-term. Returning to TCO, there are a number of studies that compare the costs of storing data long-term on disk, tape and cloud. One TCO study in particular, by the Enterprise Strategy Group (ESG), produced some remarkable findings. 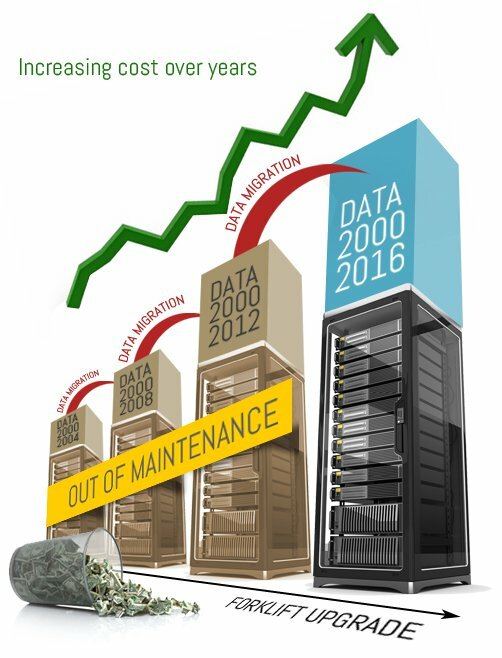 The 10-year study compared an LTO tape-based approach with an all-disk storage approach, in-house and in the cloud. According to the report, the LTO tape-based approach showed, “an impressive 577% return on investment over ten years when accounting both for avoided costs and net new economic improvements.” The study shows that tape can have a very positive impact on controlling long-term storage costs. Remember too that you no longer need to migrate data from one storage system to another, with all the costs, wasted time and risk that this implies. For example, QStar’s LTFS as NAS solution is far more durable than other data archiving systems, easily coping with upwards of 10 years’ use, with nothing like the management and maintenance costs of disk-based storage. The LTO drives internal to the library can also be replaced by those of the next generation, and written cartridges can be read by the three previous generations of drives (for further details on these aspects see the section LTFS and LTO Technologies). The LTFS as NAS solution offers secure data archiving for periods of years or even decades, on expandable memory that can be used to store unlimited amounts of data at a fraction of the cost of any other currently available storage technology. Don’t fall into the maintenance extortion and forklift upgrade trap.